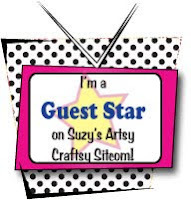 I'm over the moon happy that I'm the very first Featured Guest Star over at Suzy's Artsy-Craftsy Sitcom! Suzy is a new bloggie friend AND a fellow knitter (doin' the happy dance over here). To tune in to my supa-stah interview, turn your dial to this channel. Thanks for stopping by "In His Grip". I have been nosing around your blog and I do love the things that you have here. And I will be checking you out over at "Suzy's Artsy Craftsy Sticom." I love this blog world.